Scans include the front and back of a 6 page (fold-out) AF advertising brochure found stuffed inside the jacket. 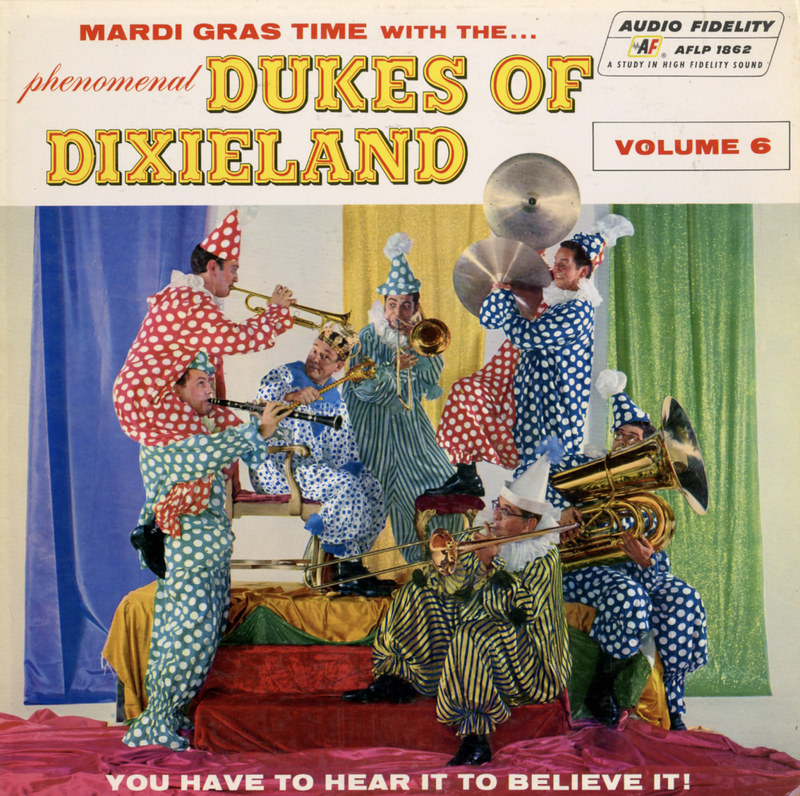 From the back cover: The Dukes Of Dixieland are building themselves a niche in jazz history which will certainly go down alongside many famous combos who have played prominent roles in the growth of popular music. 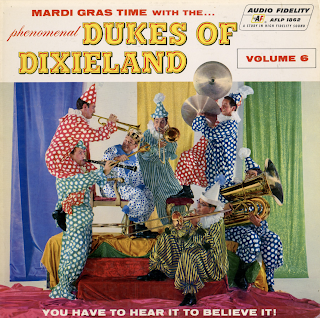 The success story of The Dukes began back in 1947, when two mainstays in the combo, the brothers Frank and Fred Assunto, formed a high school band to play Dixieland in their native New Orleans. The band took the name Basin Street Four, Five, Six, etc., depending on how many members of the group they could corral on short notice whenever they landed a playing date, and they played in various places on the outskirts of the city, including one eating place where they enjoyed a long run. For a while nothing much happened to change their course. Then one day they learned that the Horace Heidt radio program was due to visit New Orleans on a talent hunting stopover. Fred and Frank Assunto got together seven players, practiced furiously, and appeared on the program. The reception they got was so favorable that they were invited to join the show on tour. This they did, and they have traveled with Heidt as the Junior Dixie Band, winning such acclaim that they decided to become professionals. After getting together a little money, the combo quit the Heidt show, returned to New Orleans, served notice on everyone concerned that they had become pros, and bought themselves uniforms. They also changed their name to The Dukes Of Dixieland, and shortly afterward they filed an engagement at her Famous Door night club which lasted 44 months. This marked the beginning of a career that has led them across the nation appearing in extended engagements at top establishments. In addition to Frank and Fred Assent, The Dukes boast still another "spark plug" in the person of Mac Assunto, their father, who is known by the combo as "Papa Jac." Besides serving as musical "rock of Gibraltar" in the band, Jac runs the combo's business affairs. In fact, although he tries to keep it a secret, he holds a degree from Tulane University in business administration.